I walked into that yarn shop and I said yes. this is what I want. this is how I want to organize my life. items arranged according to color, tucked neatly into several pleasingly symmetrical little cubbies. instead, I am like most americans. I stuff things I don't really need under beds, into the backs of dark closets, into overflowing attics, basements, garages. make no mistake, I keep our main living spaces fairly clutter free. I'll tell you, when it comes to those areas, I'm a bit of a nut. but one peek at my basement and THE JIG IS UP. it's not that I don't have a plan. it's that the plan makes me tired. the plan requires more time than I have to give it. the plan requires things like commitment and discipline. the plan demands I throw things out, things I'm not sure I'm ready to throw out. actually, what the plan really wants is a yard sale. this is not completely unreasonable, seeing as how I have put on my fair share of yard sales (and legendary ones, at that). but for some reason, I cannot rally. I start and then people need me and/or projects need me and the whole yard sale party is over before it ever really began. needless to say, this does not please the plan. truth be told, this disgusts the plan. still, I continue to chip away. a drawer here, a shelf there, a few boxes from the attic, a file cabinet from the basement. I have learned to celebrate small victories. and when I really need a shot in the arm, I walk into a yarn shop. I eye the colors and the cubbies and I am filled with hope. I love organization. Especially by color! oh. man. you and me. I too, except mine is in an attic. I am getting better though. Instead of putting more in the attic - I will take it to the donation bin. But, still there is alot of stuff in there. Ah, the plan! I have the same plan and that plan is so relentless it whips my mind into a frenzy until I give into it's demands or until I momentarily give up and collapse into the heaps of toys and laundry. oh my andrea...i am doing the same chipping, believe me. truthfully, i don't feel i'm making any real progress, but i keep going. hopefully i'll look around one day and say, "oh wow--i'm organized!" I love and hate organizing. It's always better when it's not your own stuff, isn't it? You said it exactly how I feel about organization. I want it but it's hard stuff. 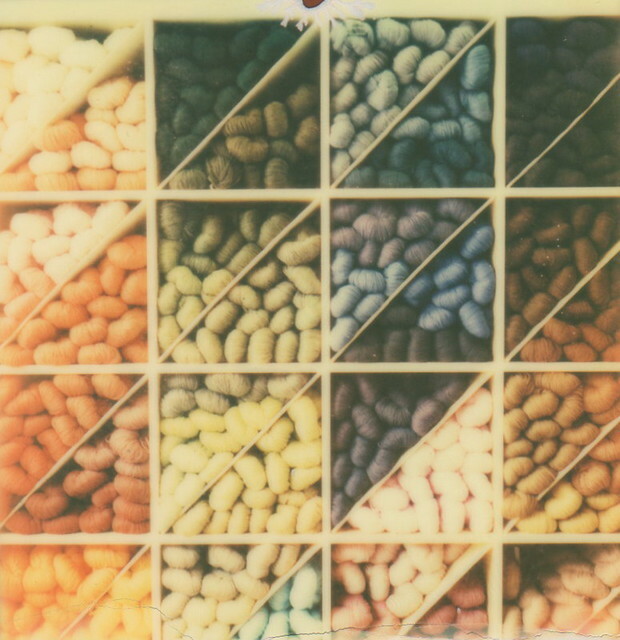 Love the yarn photo. CREATIVE MINDS ARE RARELY TIDY. Hopefully that extends to our home offices as well! oh goodness. that is so me. if only you could SEE my basement! that's my goal. to chip away a little at a time. a good yarn shop always makes me feel good. Want to come play "Craft it Forward?" If it makes you feel better, there's a person who works 30 hours a week keeping that yarn organized. Her whole job is organizing that yarn and shipping out orders. That's all she does.